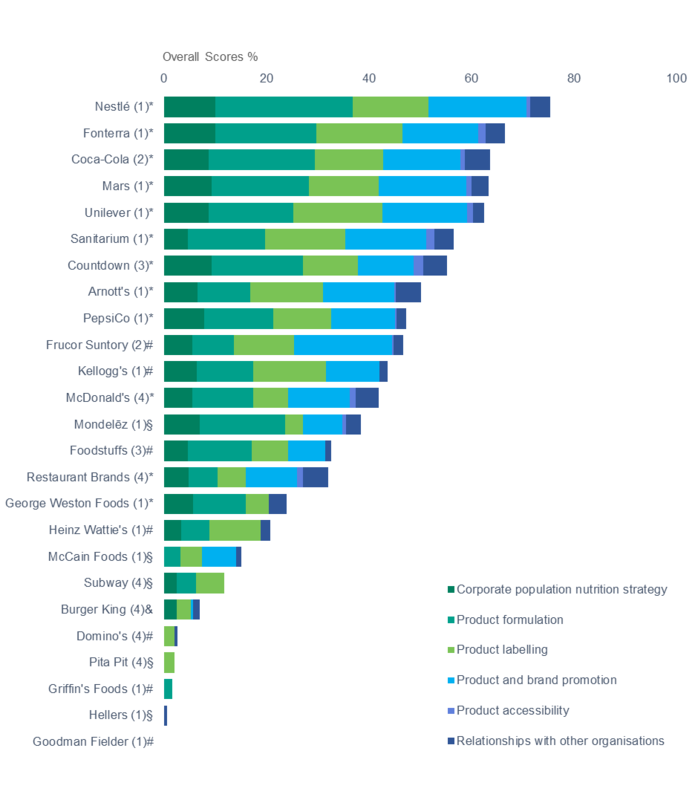 A new study ranking the nutrition commitments of 25 of New Zealand’s largest food companies has found large variations with some companies leading the way, but many are not doing nearly enough to reduce the biggest cause of ill health in New Zealand, unhealthy diets. The study, launched today by researchers at the University of Auckland, assessed the obesity prevention and nutrition related policies and commitments of 15 packaged food manufacturers, two beverage manufacturers, two supermarkets, and six quick-service restaurants. It assessed company policies and commitments across six key domains related to obesity prevention and nutrition: corporate nutrition strategy, product formulation, product labelling, product and brand promotion, product accessibility, and relationships with other organisations. The research project was conducted by 5th year medical student Apurva Kasture, as part of her medical studies. She was encouraged by the engagement of many companies in the research and that some companies are making positive steps, but the results show that much more needs to be done. Professor Boyd Swinburn, who supervised the study, said that many companies had committed to comply with the Advertising Standards Authority’s Children and Young People’s Advertising Code but stronger action is needed to protect children from marketing of unhealthy food. 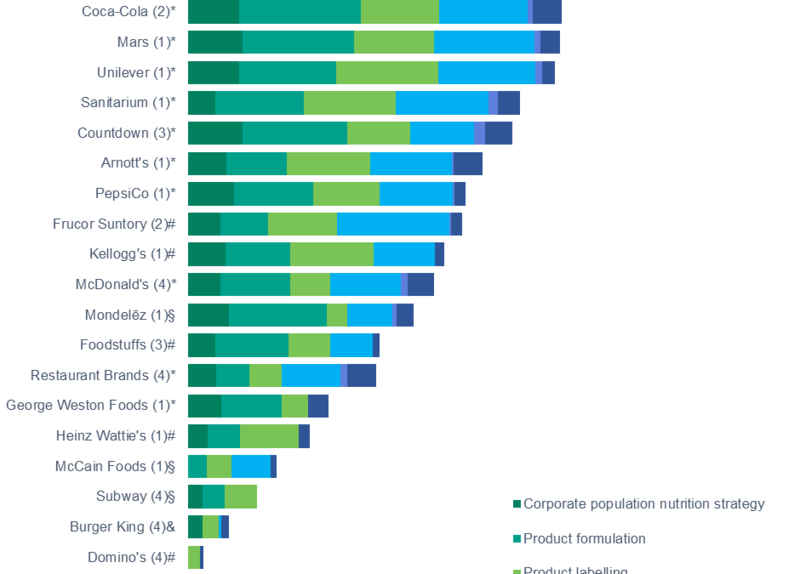 Companies performed relatively well on product labelling with many committing to implement the Health Star Ratings and providing nutrition information on their foods and meals online. Countdown and FoodStuffs have committed to implement the Health Star Ratings across all their own-brand products. Unilever use a publically available nutrient-profiling system to determine the type of nutrition or health claims that are acceptable for products to carry. Although quick service restaurants provided nutrition information online, few provided calorie labelling on meals on-site. Many food and beverage manufacturers and supermarkets are reformulating products to reduce levels of sodium and have targets to reduce sugar but this is highly variable and rarely measureable. Nestlé has a target for lowering sodium, sugar and saturated content. Frucor Suntory commits to have one in three products sold to be low or no sugar by 2030. More companies could develop targets to reduce sodium, sugar, saturated fat, trans fat and portion sizes. Companies had few commitments to restrict accessibility of less healthy foods and improve accessibility of healthy foods. Recommended actions are to limit price promotions on less healthy products, make all checkouts free of junk food and for quick-service restaurants to not provide free refills for soft drinks. A positive step would be to see population nutrition become a priority focus within the corporate strategy and to have specific nutrition targets and objectives as key performance indicators for senior managers. Nestlé and Fonterra are leading the way by recognising national and international nutrition priorities. Some companies were transparent about relationships with other organisations by publishing funding for external research and publically committing to not make political donations, with Coca-Cola, Arnott’s and Restaurant Brands the top performers. The report was funded by the Health Research Council and was based on publically available information (up to the end of 2017) with half the companies providing additional information. It was assessed using the BIA-Obesity tool (Business Impact Assessment – Obesity and population nutrition) developed by INFORMAS, a global network of public health researchers that monitors food environments worldwide, co-ordinated by the University of Auckland. The study measured commitments and transparency but did not assess the actual performance of companies in meeting those commitments or the overall healthiness of their product profiles. These will be the focus of future research. Tackling the unhealthy food environment requires a comprehensive response from government, the food industry, the health sector, and the community.